Our friends at Divine Chocolate have come up with a fantastically novel way to encourage people to send an email to politicians to keep fair trade on the agenda at next week’s G20. It’s a simple game – Egg a Politician. 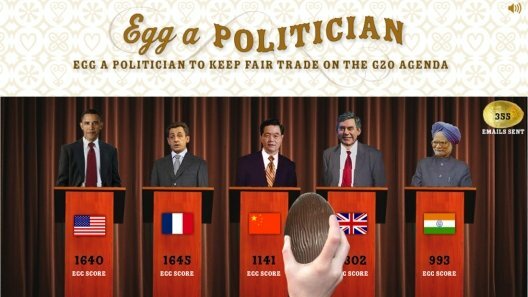 You get to throw a chocolate egg at one of five world leaders — Barack Obama, Nicolas Sarkozy, Gordon Brown, Manmohan Singh or Wen Jiabao — who are all attending the G20 summit, where finance ministers and central bank governors of 19 countries and the European Union will meet to discuss “key issues related to global economic stability”. As well as the therapy of hurling the egg at your leader of choice, you then get the opportunity to send an email to that leader – direct from the page – just as soon as they’ve devoured the chocolate. When I first read about this idea I had visions similar to the incident that saw the Business Secretary, Lord Mandelson, covered in (thankfully organic) custard at the hands of Plane Stupid activist Leila Deen. But it’s far more engaging, the world leader chomps down the egg in the animation and the e-mail option gives us all a simple and constructive way to highlight the fact that if Africa is to escape poverty, African producers and farmers need a fair opportunity to trade on world markets at a fair price. Poignantly expressing that just a 1 % increase in trade from Africa would be equivalent to five times the amount of aid the continent currently receives! Let’s make sure that everyone gets this message. It’s worth keep checking back to the page or sharing it with friends as each leader’s podium has a counter of the number of eggs they have received, there’s a counter too of how many e-mails have been sent to the leaders. If all this talk of chomping Easter eggs has made you hungry then you can check out Divine’s Easter range by clicking here.